Expedition Dispatches and the Latest News! What an amazing place Pakistan is. Despite the searing 40C temps out yesterday, i managed to take a small taxi to our local expedition support office to meet with its owner Ashraf Aman. This unassuming man in his mid 70s was asleep on the couch when i arrived. He promptly jumped to his feet and gave me a warm greeting and a strong hug. I had met him last year but I had no idea who he actually was. In 1977, with a joint Japanese Pakistani expedition he was the first Pakistani ever to stand atop the worlds 2nd highest peak, the mighty K2, still revered as the worlds most dangerous and difficult mountain. In addition to being awarded the Presidential Medal for Performance, he also made the second ascent of this killer mountain since it was first scaled in 1954 by a very skilled Italian team. I sat awe struck as he told me how easy places like 'houses chimney' is now days, and the rock band before Camp 3. I felt like bowing down in his presence but that would have just been foolish. The bottle neck he said, is the place you DONT want to fall. Everything else is easy now. "We made the route for the rest of the world" said Mr. Aman. 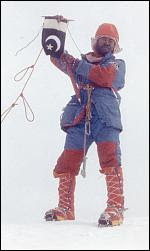 Oh and another thing, he didnt bother using supplementary oxygen on his ascent either. A quick look at the clothing he is wearing is a testament to the true scale of their endeavor. Well enough about K2, for now we climb G2, slightly smaller, much tamer and a classic stepping stone to the legerdary giants like K2. I have met many expeditions here in Islamabad and it seems the flights to Skardu are running. Sadly, i awoke this morning to monsoon rains and a humidity like noting i've experienced. I forsee a 20 hour drive in our near future. Naucho and i have already arrived and in a few short hours, Clare, Andrew, Fred and Surech will arrive and my work will begin. Tomorrow, the 10th of June, Jean Rene and Francois arrive followed by Mark on the 11th. What ever happens, we will be on the road or flight in the next 48 hours. I send best wishes and big hugs to all on behalf of myself and all of the Field touring Alpine Gasherbrum 2 2008 expedition. Welcome to the FTA Blog! On our blog you'll find news & updates from our expeditions & treks. Visit our main site for trip details, images galleries, and much more! Get news, updates, special offers and more! Follow the FTA Blog by Email! ...and then there were three.